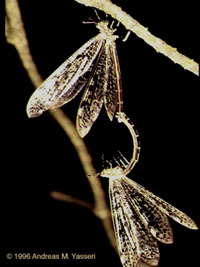 After emerging from their cocoons and allowing their wings to expand and harden, adult antlions fly into nearby trees. Nocturnal creatures, adult antlions rest on dry twigs during the day. At night they hang on the twigs, with raised wings. Yasseri and Parzefall (1996a) hypothesize that such behavior forms part of mate location and courtship. Mating is a rather acrobatic affair. As the female clings to a twig, the male attaches his tail to hers. He then hangs below her, suspended only by his genital apparatus (see Figure 1). Copulation lasts nearly two hours. After separation the female cleans up by feeding on the remaining spermataphore (Yasseri and Parzefall 1996a, based on field observations in 1992). Laboratory studies have detected volatile compounds produced by the adult male Euroleon nostras. Researchers hypothesize that these compounds may function as "aggregation" pheromones in antlion mating behavior (Yasseri and Parzefall 1996b). Figure 1. Shown is a mating pair of Euroleon nostras, a common European antlion species. See Monika Haenel's drawing based on this photograph. Photograph © 1994 Andreas M. Yasseri. Reproduced with permission. Figure 2. Female antlion laying eggs in the sand. See Monika Haenel's drawing based on this photograph. or "oviposition," occurs in the sand. When a female finds a suitable place, she repeatedly taps the sand surface with the tip of the abdomen. She then inserts the abdomen into the sand and lays an egg (see Figure 2). She repeats this procedure several times if she remains on a particular patch of sand. During egg laying she raises her wings and moves them very fast with short wing strokes. In captivity females lay an average of 20 eggs and show a preference for warm sand. After a successful oviposition fit females return to the tree, where mating possibly occurs again (Yasseri and Parzefall 1996a). Scientists have observed a wide range in adult antlion longevity. The average life span is 20 to 25 days but some adults have lived for more than 45 days. Ironically, because they emerge and lay eggs in the sand near active larvae pits, adults occasionally are captured and eaten by their younger relatives (Yasseri and Parzefall 1996a). Yasseri, Andreas M., and Jacob Parzefall. 1996a. Life cycle and reproductive behaviour of the antlion Euroleon nostras (Geoffroy in Fourcroy, 1785) in northern Germany (Insecta: Neuroptera: Myrmeleontidae). Pp. 269-288 in Pure and Applied Research in Neuropterology. Proceedings of the Fifth International Symposium on Neuropterology. Cairo, Egypt, 1994. M. Canard, H. Aspöck, & M. W. Mansell. (Eds.). Toulouse, France. Yasseri, Andreas M., Gunnar Bergstrøm, Wittko Franke and Ann-Britt Wassgren. 1996b. Laboratory studies on the role of volatile compounds in mating of the antlion Euroleon nostras (Geoffroy in Fourcroy, 1785): behavioural and chemical aspects (Insecta: Neuroptera: Myrmeleontidae). Pp. 289-297 in Pure and Applied Research in Neuropterology. Proceedings of the Fifth International Symposium on Neuropterology. Cairo, Egypt, 1994. M. Canard, H. Aspöck, & M. W. Mansell. (Eds.). Toulouse, France.